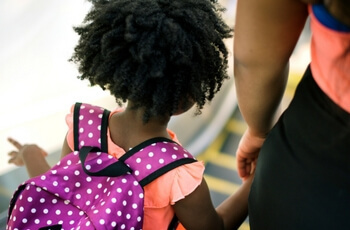 Carrying a backpack that’s overly packed can cause strain on your child’s spine. ‘Growing Pains’. Children reporting heel, knee or leg pain and stiffness especially when doing a heavy sporting workload. Changing the biomechanics of the child’s joints and pelvis and releasing tight muscles can have a profound effect on enabling the child to continue their chosen sport. Lower back pain. Sometimes falls from the monkey bars or whilst playing AFL / soccer / rugby onto the pelvis and lower back can alter the correct bio mechanics which may alter a child’s gait and movement. Small corrections by a Chiropractor can quickly help these pains and stiffness. Foot and ankle / heel pain. ‘Flat feet’ can predispose a child to ‘Growing Pains’ and other soreness. Correction with soft Orthotics in their shoes or even changing the type of shoe worn can help decrease the pain and discomfort. Children seem to enjoy their adjustments. Besides requiring a lighter touch than the ones you receive, most children respond quickly. They rarely have the build up of scar tissue that we often see in adults with long-standing problems.